drivers, distracted by her dancing moves. 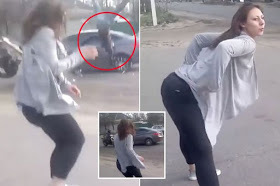 The video, shot on a mobile phone, begins with a young woman dancing in a quiet street, as several cars pass by without incident. As she shakes her behind, a motorcycle can be heard approaching the area. as debris is sent flying. 0 Response to "Lady Causes Accident Between Two Drivers As She Was Twerking On The Street (Photos)"